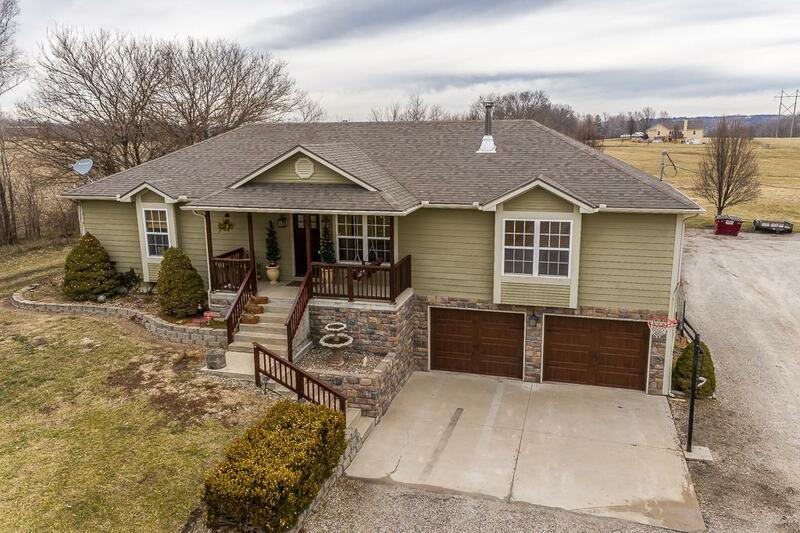 GORGEOUS RANCH HOME ON ALMOST 5 ACRES WITH POND! Home has been upgraded with hardwood floors throughout the main level, new granite counters in kitchen, and HUGE bedrooms sizes all with walk-in closets! 2nd bedroom has been converted to a formal dining room - could easily be converted back to bedroom. Large master suite features walk-in closet and large master bath connected to laundry! Walkout basement is finished with HUGE family room & full bath! Property has a stocked pond with dock and 40x30 shop! Directions: From Dempsey Rd go South on 207th St, Turn right on Brandt Rd to home. Or From Tonganoxie Rd in Tonganoxie turn left on 207th St, left on Brandt Rd to home.